First Taste Thought – Delicious! Well, I now have a new favorite everyday balsamic vinegar. I was very pleasantly surprised when I tasted this. I am usually very skeptical of products that don’t list their ingredients. However this turned out to be one of the tastiest and most versatile that I have found yet. It has a nice sweet balanced flavor with just the right touch of vinegar. This is perfect for salad dressings, reductions, glazes and more. It is also the least expensive balsamic that I have found that could be used for fruits and ice creams as well (although not as good as the thicker more expensive versions). I highly recommend this as an excellent everyday value. Description – It takes special care and years of aging in oak barrels to create our exceptionally smooth, naturally mellow vinegar. We use only the finest Trebbiano and Lambrusco grapes from the Modena Region of Italy. These grapes produce a delicate yet complex balsamic vinegar that captures the essence of the heart of Italy. It can be used to enhance the flavor of meats, fish, raw and cooked vegetables, and as a delightful addition to salad dressings. Excellent as a topping for fresh fruit and vanilla ice cream. Where can I purchase Nob Hill Trading Company – Aged Special Reserve Balsamic Vinegar of Modena and/or Acetum – Aceto Balsamico di Modena – Black Label, 4 Leaves? I know that you can get it Raley’s grocery store. Hope this helps! How can I purchase Nob Hill Balsamic wholesale for my restaurant? 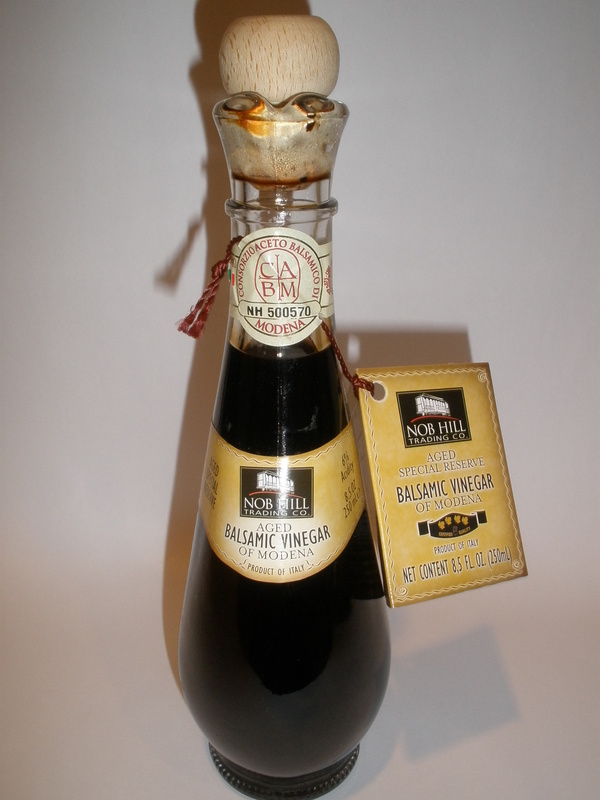 I would like to know if Nob Hill Trading Company’s Aged Special Reserve Balsamic Vinegar of Modena contains salt. I am supposed to be on a salt-free diet due to heart condition. Please email reply. Thanks so much.